Zincite is fiery stone that can appear as either a grainy mass or transparent crystals when smelted. It is a zinc oxide crystal that has a hardness of 4, soft by cut stone standards. 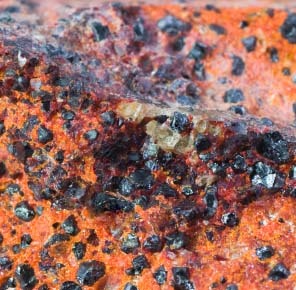 Franklin, New Jersey, is the most important location for Zincite, where it is massive formations composed of Zincite, White Calcite, Willemite and Franklinite. Zinc oxide is used in mineral based cosmetics for its smoothness and healing powers, especially for skin and hair. A compound called “zinc white” has been produced as a result of industrial synthesis and is widely used as additive for gum, cosmetics, pharmaceutical and coating compound. In the 1980s, single crystals of synthetic zincite, which grew as a by-product of industrial uses started appearing on the gem market as cut stones for jewelry. The magazine “Gemmology” featured this material in 1995, where its formation through zinc white production was explained, and the stone drew more attention. It is prized as a cut stone for its transparent nature and colors. Usually found in red, orange-yellow, green or colorless, and most abundantly in Poland, Italy and the United States, it is known for its ability to attract abundance at physical and spiritual levels and synthesizes physical energy with personal power and creativity. Not only does Zincite instill confidence, but is known to heal shock or trauma and instill courage to deal with traumatic situations or painful memories. Zincite is a fire element that controls life force, creativity, sexuality, personal power and manifestation. Zincite resonates with the lower or root chakras, which are the 1st, 2nd (Sexual/Creative) and 3rd (Solar Plexus). Zincite, through these chakras, reenergizes the whole body and enhances gut instinct and intuition. It is useful in dealing with phobias, releasing mental imprints, and helps alleviate menopausal symptoms. Its healing powers are known for skin and hair improvement. Zincite has also been found to boost the immune system, which helps treat AIDS and CFS, helps prevent epilepsy, mucus conditions like bronchitis and treat problems of infertility. Zincite is a mineral form of anti-oxidant, by boosting the immune system, it can fight free radicals and pollution that attacks cells, and helps protect and aid in regeneration. In spiritual healing, it is known for creation and manifestation. It aligns with the creative flow of the Universe and helps you to direct it for positive outcome. In the emotional healing realm, Zincite can help you overcome feelings of inadequacy by empowering you to change your life and experiences. In the physical sense, it strongly stimulates sexual interest or fertility. Zincite helps remove negative energy and brings new forms and ideas into reality. It has intense energy levels and can help clear energy blockages that may be causing a person to fail to act or procrastinate. In moderation, it can help break through limitations and bring dreams into reality. Excessive use can over-stimulate and cause excessive anger, flushing and other uncomfortable symptoms. Zincite is a mineral element that services many purposes in mental spirituality, personal powers and creativity. It is used for its healing powers of skin, in mineral based makeups. Learn more about zinc mineral of mineral makeup.